'Everyday Demons' moves with threatening infectiousness from song to song like the first sips of fine Absinthe. Even when songs turn towards more average rock as on 'Walkin' Mat' or 'Tonight,' you're still subverted by The Answer's honest confidence and impressive musicianship. Even these songs are genuinely inspiring. 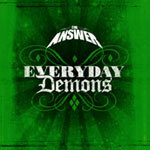 'Everyday Demons' is all that we expected from The Answer: swaggering, earthy, blues driven hard rock of memorable proportions. Album of the year? Maybe. So here we go again with the predictions. 'Everyday Demons' is all that we expected from The Answer: swaggering, earthy, blues driven hard rock of epic and memorable proportions.